While it might not qualify as a regulation Tall Card deck, when it comes to playing Earth-That-Was card games, there's nothing quite so versatile as Firefly Playing Cards. A standard 52-card deck printed on Bicycle-grade paper with a satiny embossed finish, every inch of this deck is designed with Firefly in mind. 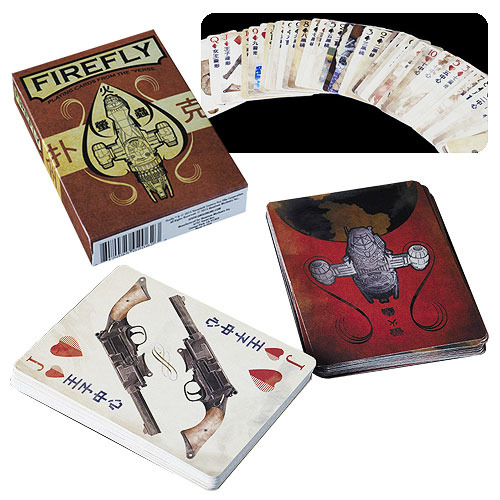 Whether it's Vera on the Jack of Clubs, the companion taking a sponge bath on the Queen of Diamonds, or Serenity herself on the Ace of Spades, the Firefly Playing Cards sport dozens of unique works of art from the mind of renowned Browncoat artist Ben Mund! Ages 12 and older.